It’s a quiet day here in Elverson, Pennsylvania. I’m manning Painted Table Designs today, launching the start of their Monday – Saturday hours. While it’s quiet and I’m enjoying the productivity, I wanted to share a simple before and after furniture makeover with you using Miss Mustard Seed’s Milk Paint. 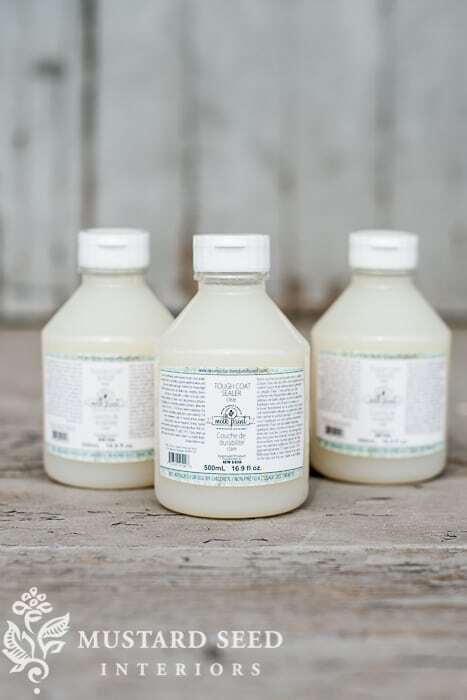 At this year’s Lucketts Spring Market, I spent 90% of my time in Miss Mustard Seed‘s pavilion doing Milk Paint demonstrations and answering paint questions (which made me a very happy girl). I didn’t do too much personal shopping, but one of the chosen few items I picked up was this beautiful antique oak table from Hummingbird Hill Custom Creations. They were conveniently located just a few lots away from Marian’s space, so I hit their tent first. It was constructed out of the most beautiful antique oak. I’m a sucker for old oak, and I knew that the grain would show beautifully through a few coats of Miss Mustard Seed’s Milk Paint. The lines and shape were simple but beautiful. I like the addition of the shelf on the bottom. It adds stability and small storage – double score! The size made it versatile. It could serve as a coffee, side, console, or end table. It could even be a writing desk if you pop your legs through the bottom! The price. It was completely affordable for a girl who (believe it or not) is on a tight budget. All of these things resulted in it being lovingly packed up in The Marshmallow for the long drive home to Pennsylvania. It took a few weeks for me to start work on it because I needed time to settle back into the groove of life after Lucketts. 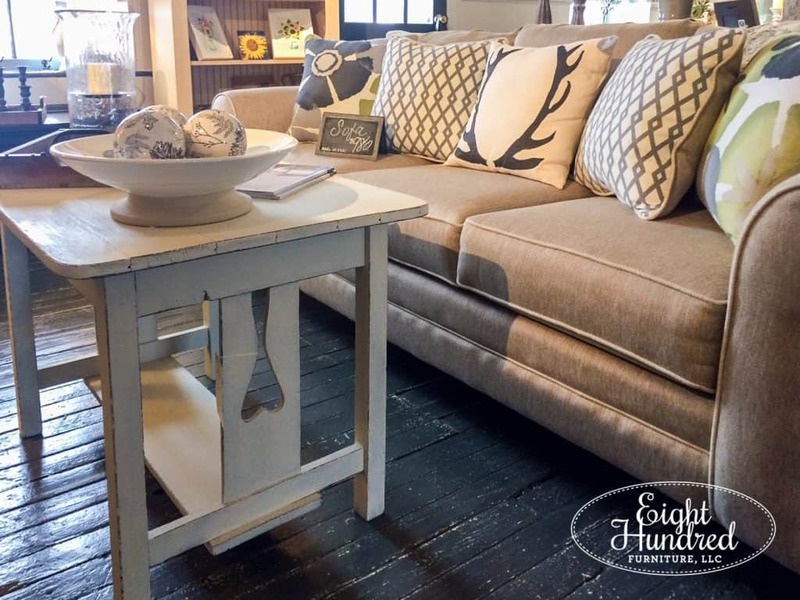 After chatting with Brenda (owner atPainted Table Designs) about what color to paint it, we settled on a 50/50 mix of Linen and Farmhouse White. She has excellent taste and was reworking the living room area of her shop. I wanted to make sure I painted it a color that would fit in. 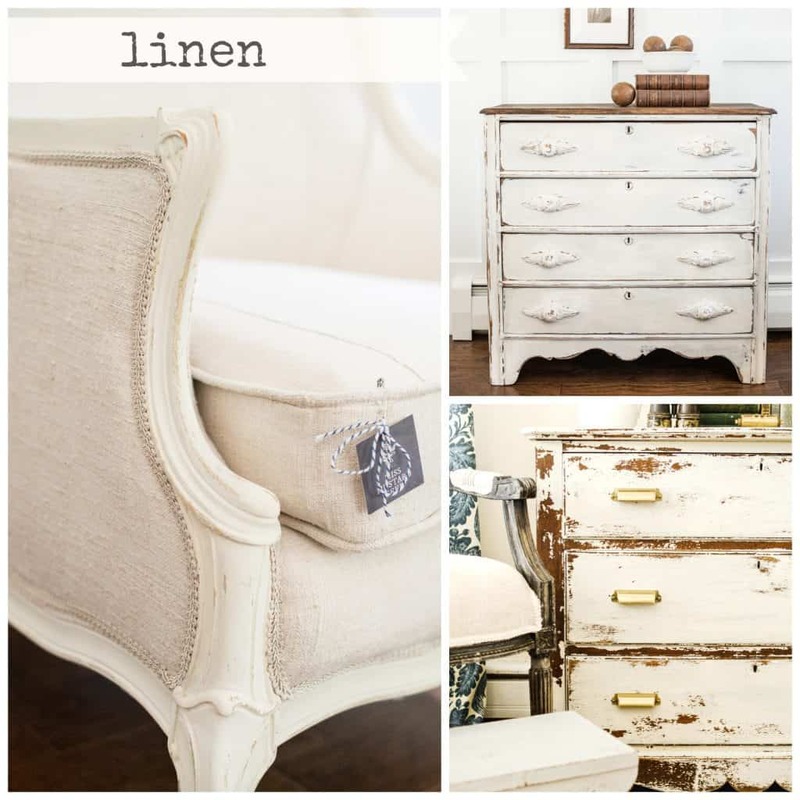 Linen is a creamy white with yellow undertones. It adds instant warmth and is the cream of the MMSMP line. 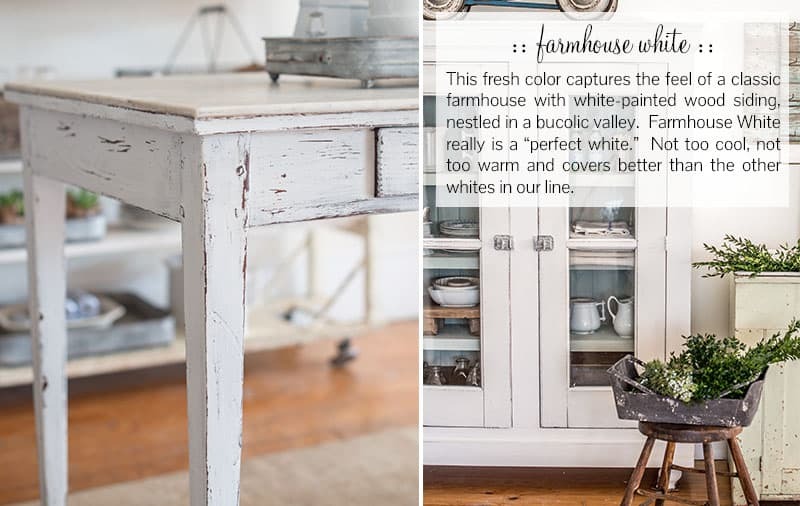 By adding the Farmhouse White, it toned down the yellow and brought out more of the white in this shade. It essentially created the perfect off-white. The table was a bit wobbly, so I spent about an hour taking it apart and putting it back together, taking care to strengthen all of the joints. The screws were all loose and it needed a few gentle taps with a hammer to get it tight and sturdy again. Because the color of the wood was so dark, I painted a layer of Tough Coat all over it first. 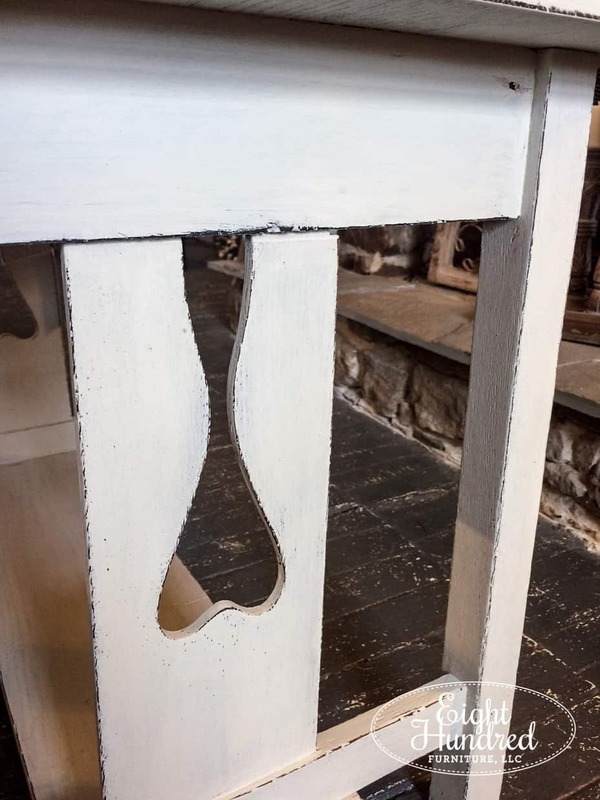 This would ensure the dark stain wouldn’t bleed through the Milk Paint. This is one of the many ways to use this incredibly versatile product. I sealed the table with Hemp Oil and did some wet sanding to distress and smooth it. After allowing the Hemp Oil to cure for a few days, I packed it up in The Marshmallow and brought it over to Painted Table, where it now happily resides in the living room of the store. 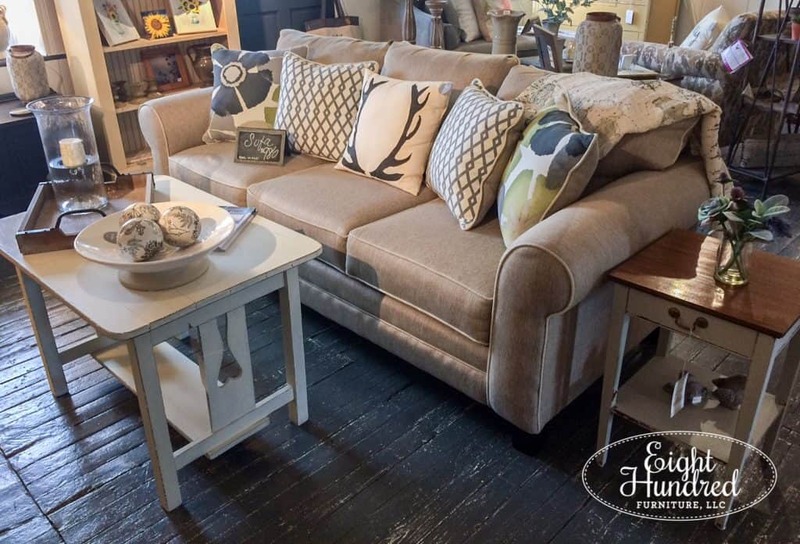 Brenda staged it to be used as a coffee table, and it matches the living room sofa perfectly. As anticipated, the oak grain is still visible through the Milk Paint, which is one of my favorite aspects of using it. 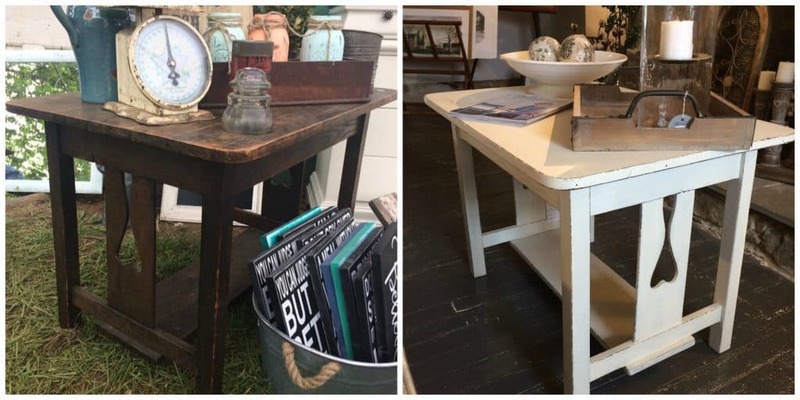 MMS Milk Paint soaks in more like a stain on raw wood rather than laying on the surface like a nail polish does. This soaking in property allows the grain of the wood to still be visible through the paint, which I absolutely love. Some people get very upset when people like me paint old furniture, but that pretty oak grain is still preserved and visible! And so there you have it folks. A simple before and after makeover! 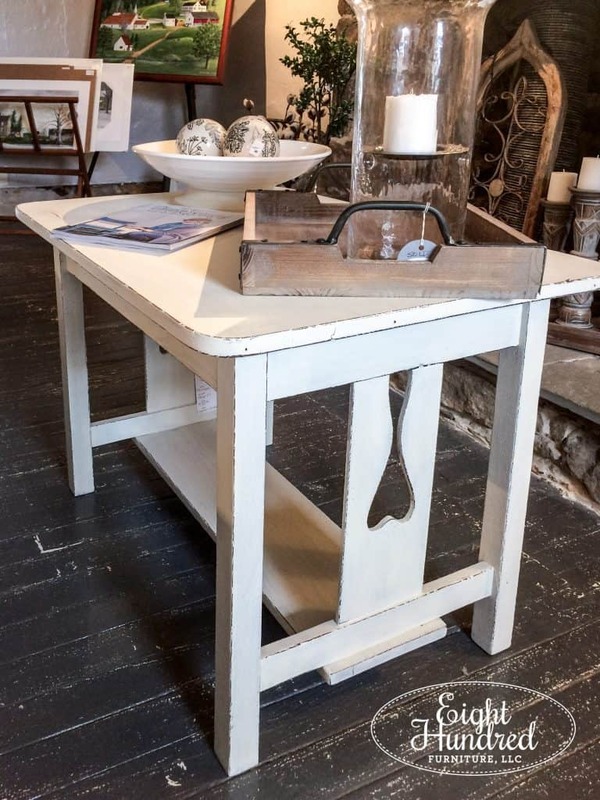 This table is currently for sale at Painted Table Designs for $174. Please contact the shop if you’re interested or send me an email. 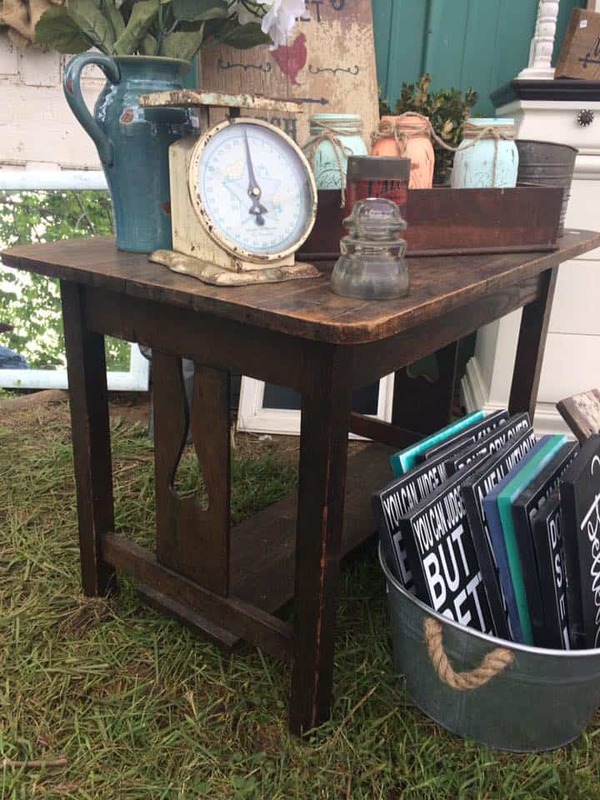 You can shop for all of the products I used in this makeover at Painted Table Designs or in my booth downstairs at Morgantown Market.